All of this software is "Open Source": see opensource.org for a precise description of that term, but basically it means that anybody may download, copy or use anything on this page. Where applicable, more specific information is provided along with the download. That's all that I'm going to say here; more detailed explanations of the many different open source licences available would be pointless and of interest only to lawyers. No warranty is offered, of course, although I would welcome any comments, suggestions or bug reports. Updated versions will appear on this page as they become available. This software was developed under KDE 3.1.2; it can be installed and used on that or any later KDE 3 version. See kde.org for more information and downloads for KDE, the K Desktop Environment. All the KDE software here is released under the GNU General Public Licence. A desktop front end for a Doom™ game engine. Allows easy selection of playing options, and can automatically download and unzip addons or demos from remote sites. See the Kadoom page for more information and downloads. The classic Repton 3 game originally released on the BBC Micro and now brought to the KDE desktop. See the KRepton page for more information and downloads. When installed, this adds an additional tab to the file properties dialogue in Konqueror (the KDE file manager and web browser). 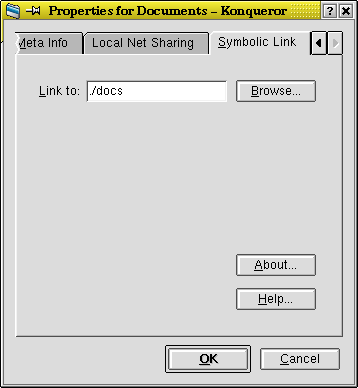 It allows the destination of a symbolic link to be viewed and changed. There's not really much else to say, except that hopefully you will find it useful on at least one occasion. I wrote it both as a potentially useful addition to the GUI (which some others have suggested as well, see KDE bugs 29277 and 22540). Also as an exercise in the technicalities of writing a plugin (which I still don't claim to fully understand :-) and Docbook documentation. Documentation is available via the KDE help system once the plugin is installed. All of this was first developed on a Slackware system with 2.0 kernel; as far as I am aware it should be usable on any similar Linux system. Guistart is a simple menu utility which I use for selecting X startup options when logging in, although there is no reason why it should not be used for other menu-based selections. It somewhat resembles the W*nd*ws startup menu. Here is the README file; once installed there is a man page with more information. You might ask why this is necessary, especially with GUI-based login systems such as xdm. Unfortunately, in the current X implementation there is no easy way of switching screen size or colour depth once the server is started, and even if this were possible there is no way of communicating to running clients that such a change has occurred, let alone expecting them to react to it. Which is unfortunate: this can be done in Windows (the facility was introduced in Windows 95, and claimed as a major innovation, even though Acorn's RiscOS had been able to do so many years before), and any serious rival ought to be able to do the same. This is a Linux kernel patch which replaces the somewhat irritating cursor generated by the PC's video hardware by a more versatile software-generated one. It is very useful when using the text console on laptops, where the standard cursor can be hard to see, although it works just as well on CRT screens. The software cursor can be an underline or solid block, blinking or not, and its colour can be set to any of either 8 or 16 colours depending on the hardware. Earlier versions of this patch were produced by Bill Paul and maintained by Sander van Malssen, with contributions from others. This patch package version is for the 2.0 series kernels, and also incorporates some additional features. The patch is obsolete with the 2.2 series kernels, since the software cursor code is incorporated as standard (although not enabled by default). However, this patch may be useful for those who have not upgraded to 2.2 yet, or do not wish to do so. Here is the README file and the LSM entry (although I haven't uploaded the patch to any of the FTP sites yet...). Emacs is a text editor with much more besides: specialised modes for editing documents and programs in almost any language, mail and news readers, access to the underlying operating system and the Internet, and even a Web browser. Some love it, some hate it, some even worship it, while others merely devote their time to making up amusing or facetious acronyms for its name. There are currently two major branches of Emacs on Unix-like systems: XEmacs (formerly "Lucid") and FSF ("GNU"). I personally prefer the former, for various reasons, but the choice is yours. VM (the Emacs mail reader) has a toolbar, naturally: unfortunately the icons supplied as standard are rather large and intrusive (see here for the reason why). This alternative set is the same size as the standard toolbar, and is also a bit more colourful (when running on a suitable display). Here's a preview of a typical VM toolbar with these icons installed. To install the icons, simply unpack the downloaded archive in the top-level Emacs directory (you may wish to save the original contents of the etc/vm directory first). Then start Emacs and VM in the normal way. Editing sendmail configuration files directly is strictly for masochists. Later sendmails have the M4-based configuration system for building the file; however, it is still sometimes necessary to customise the file. Even if this is not necessary, some of the local configuration, especially the 'specialchecks' file which is so useful for blocking spam and relaying, still needs to be set up by hand. This major mode attempts to ease that process by providing syntax colouring, some help with indentation, and checking for common but invisible format problems. Having done so, you can select this mode with M-x sendmail-mode or any of the other methods, and see the configuration file in all its glory. Here it is in action in XEmacs; click on the image to see a larger version. See the comments at the top of the Lisp file for further description and usage information. Unlike sendmail above, at least the configuration files for the Apache web server are designed to be readable. However, it is still nice to have syntax colouring in order to clearly set out comments and to check for mistyped keywords. This major mode does that. To use it, simply download apache-mode.el and install it as above. Select this mode with M-x apache-mode or any of the other methods, or see the comments at the top of the Lisp file for a description of how to set up Emacs so the mode will be automatically selected where appropriate. Note: This web page was the original source for version 1.00 of the Elisp file. Since then others have taken it and updated and extended it to work properly in other versions of Emacs and to add keywords and syntax for new features in configuration files. That is good, and in accordance with the spirit of open source software; unfortunately that means that there at least three versions that I know of being distributed. Your Linux distro or Emacs package system may include this mode already installed or available; if so then by all means use it. If you need to download and install the mode yourself then please fetch what I believe to be the definitive version from https://github.com/martenjj/apachemode. The astute reader may have noticed that apache-mode and, to a lesser extent, sendmail-mode above both do pretty much the same thing: syntax colouring of comments and keywords, modifications to the syntax table, indentation and some keybindings. As an alternative to a proliferation of such modes, it really ought to be possible to implement a "generic" mode (possibly even a minor mode) which does exactly the same but which is capable of being customised (preferably using a simpler syntax than the raw font-lock regexps). GNU Emacs has "generic" mode which implements some of the above (rule-based syntax colouring, comments, and keywords for some file formats). This mode should work in XEmacs too, but I don't know why it isn't included as standard.